Colorful lights bursting in the sky, diyas twinkling in the starry night and waves of laughter bursting from a gathering delight. 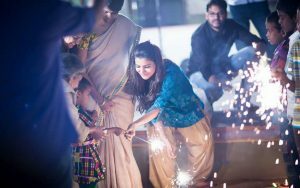 Diwali is not only a festival of lights but it is something much more than that. 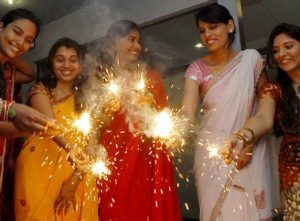 Make this Diwali not only a festival but a dangling spark of happiness. 10) Throw an arrow of happiness on all social media platforms. Social media is that place where you splash all your feelings and emotions because why not? 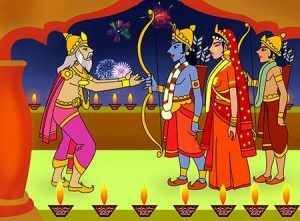 This Diwali, wish that archenemy of yours, even if you had a cold-blooded war with him/her. Go on the road of a philosophical journey by saying, everyone, what they mean to you. 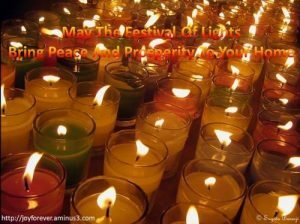 Have a “Dil Wali Diwali” where you can write down daily posts about a person i.e. how you met him/her and how the bond of relationship has strengthened over the years etc. Spritz all the feelings of happiness to the people who mean and also not mean most to you. 9) Send a Greeting or E-Greeting card. Can I know my dear reader, when was the last time you actually made a greeting card or sent a personalized E-Greeting? Okay, stop contemplating and come out of that rollercoaster past. 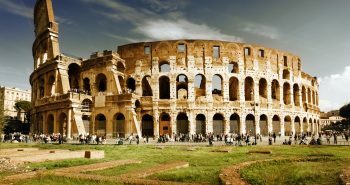 I know you might be thinking that this is a little bit old fashioned or out of stock but the charisma behind sending a greeting card is that of, spur of the moment. Nothing can be compared with an old-fashioned, handmade with love greeting cards. So bring out that creative person within you and proliferate happiness. 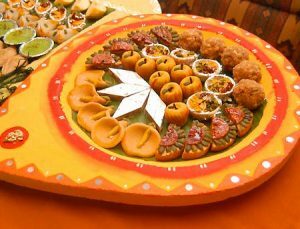 8)Let everyone have a taste of Diwali delight. 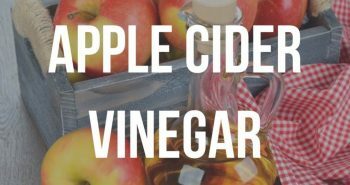 Yummy, mouthwatering snacks and confectionaries will not be resisted by you or me or that other person who is dieting because you just can’t resist all the lovely eye candy sweets and snacks. Make this Diwali a hearty one and let everyone have a taste of that yummilicious food. I think if you make some delight, it will be sweeter than it actually is wink*. Greet that scary neighbor of yours with a warm smile and a plate full of all the rosy eatables. I am sure he will return the plate with the widest smile. 7)Loose all your worries and become childish. Yes, you read right. Tear apart those self-created boundaries and let loose of that childish self in you because if not you who will? I know that nosey aunt will mock you about your behavior but Diwali day will be your day and no one can take that away from you. With your adult childishness make everyone burst with laughter. Don’t let your ego alter the course of your happiness and also in spreading happiness. For this one day, make it a pact that you will be that person which was lost many years ago; be that person who you were and who is hiding in that ego and boundaries. 6) Let everyone know why and how Diwali is celebrated. Everyone may or may not know why Diwali is celebrated. They might just know little details about it, so call out all your brothers/sisters from another mother and have a “Let’s celebrate Diwali” week so that nobody is left who doesn’t know why and how Diwali is celebrated. Make it a sleepover kind of thing where everyone gets to know ancient stories and also, poojas to be done on that day. 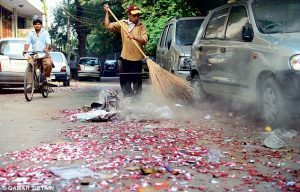 5) Make this Diwali pollutionless and animal-friendly. 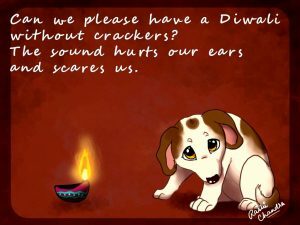 Animals are scared by the nasty noises of crazy crackers, so they will not put their best smile on the face and this doesn’t count under the list of “let’s make everyone happy this Diwali”. You can spread a word through flyers or posts on social media platforms by pleading everyone to make this Diwali a less noisy but a spectacular one. Same counts for a pollutionless Diwali. Do enjoy with the sparkling crackers but make sure that everyone is happy with your celebration because you don’t want your angry neighbor to burst out his cracker of angriness. 4) Make this Diwali special for your loved ones. Honestly, there can be no other day when you can splurge your box of happiness and sprinkle it with some lights and give it away to that honey bun of yours. Both of you were busy working your way through life and seriously, festivals are the twilight times when you can make some special arrangements to your bae or that beautiful/handsome guy/girl you’ve been eyeing on. So take this clear and bright moment and make it into something special because moments are something worth grabbing for. 3) A day spent with Grandparents are precious. 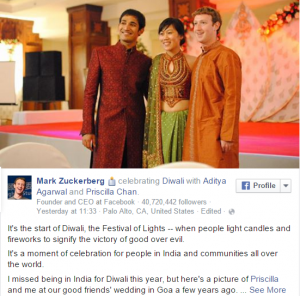 Diwali was celebrated in a much different way than it is celebrated now. I know that little curiosity of yours must be searching for the answers of long lost traditions which are nowhere celebrated now. So have a chair and sit down with your grandparents because you are going to have a rollercoaster ride of age-old traditions and customs. I am sure that your eyes will be a teary one when you see that your grandparents were so famished to share a laugh and a moment with you. And by the end of the day, you will say kudos to yourself. 2) Celebrate it with children. I know this point is similar to point 7 but it is worth mentioning because celebrating it with children will take the festive day to a whole new level. And the whole point is to actually be happy, so why don’t we make a child’s memories of Diwali happy? admirable enough? I know that you will have a jolly time with children because you get to be a child once again but if you are a child who is reading this then grab that beautiful sister’s hand and make her and your Diwali a special one. 1)Organize a party which includes orphans. 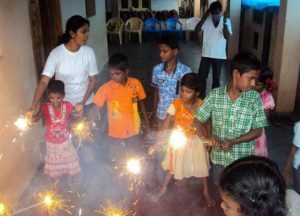 I think that this will be the best day of orphans and your list of “Making everyone happy this Diwali” will be complete with a star because nothing will be better than making a person happy who has not tasted the sweetest fruit of happiness. Organize a party for a week or few days which will include full on jolly time, take out that creativity in you and organize Antakshiri part and all the games which you used to play in your childhood days. Make sure that they have delightful snacks because you never know how many days their belly was left empty. With all the above points your Diwali will not only be a happy space for you but also to those who mean and didn’t mean the most to you. Living my life Queen size.